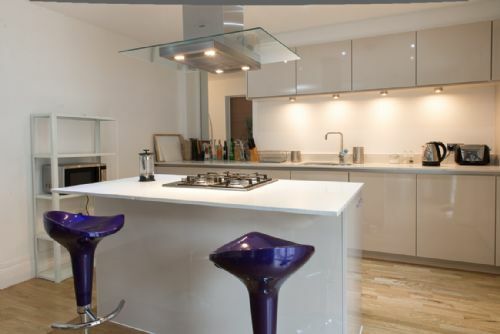 Cool & modern 2 double bedroom apartment with 2 bathrooms, open plan living room kitchen and garage parking. 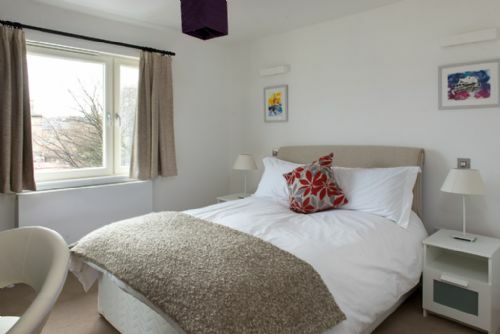 A great location to walk to the Book Festival and Assembly Rooms and a quiet location for a good nights sleep. We have stayed here quite a few times and thoroughly love the apartment. We had 7 great nights in Dean Bank many thanks to all at Greatbase they provide a wonderful service and the flat is first class. Situated in Stockbridge. Easy access to buses. 25min walk from Princess Street. Modern spacious apartment in a secure area. Well equipped kitchen. Excellent bathroom and shower facilities. Choice of pubs and restaurants around the corner. 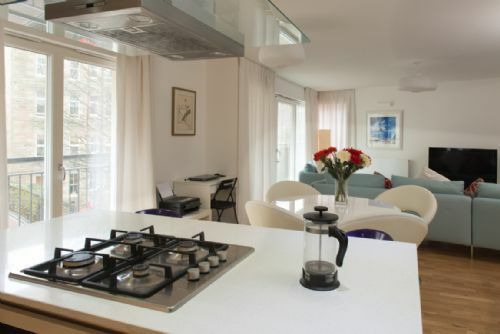 Great flat in a great location with everything you need for a few day visit. Two minute walk into Stockbridge where all amenities are on hand. Had an enjoyable stay. Only comment is that we were not supplied with a face/wash cloth or a composting bin. other than that the place was perfect. Second time staying in Dean Park Mews. The apartment is furnished very well with high quality furniture and has everything you need. High quality towels and bed linen are provided. 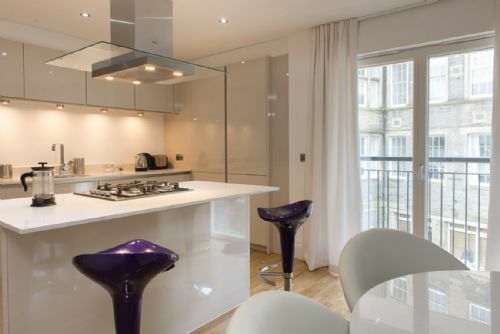 this flat is in Stockbridge and 2 minute walk to some great shops and restaurants. The decor was good and the facilities excellent. 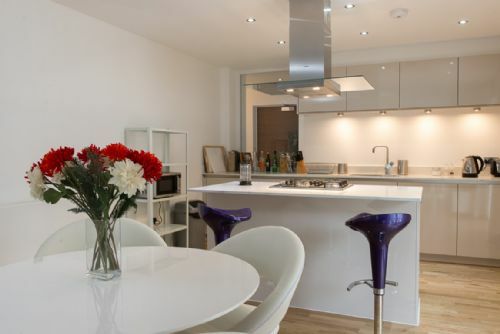 A lovely modern apartment in a great location for exploring the beautiful city of Edinburgh. Onsite parking/garage was just an added bonus. The staff at Greatbase were very friendly and helpful and I'll certainly use their website on my next visit. I couldn't have been more pleased with this flat. Firstly it's location was great for access into Edinburgh by foot but also we had a car and the garage is a must in this area. Someone was there to greet us with the keys at the requested time. The flat was spotlessly clean and there was every appliance you could possibly need (and it worked without having to retrieve a manual - you'll know what I mean if you travel alot!). There was also nice little touches such as flowers, shampoos, biscuits, milk in the fridge, tea/coffee. I would definitely stay here again. Really nice accommodations! Modern and clean apartment. Spacious with everything that you may need for a comfortable stay. Nice touch to have books, DVDs and plenty of radios around. Enjoyed our stay thoroughly. Thanks Katie! One of the best places we have stayed in Edinburgh and we have stayed in many over the last 10 years. Will stay there again. What a find. We stayed here due to a cancellation by the people where we had booked and what a find this apartment is. We were given a warm welcome by Jack who showed us round and was very accommodating as we did arrive a little early. He made sure we were settled in and had everything we needed. 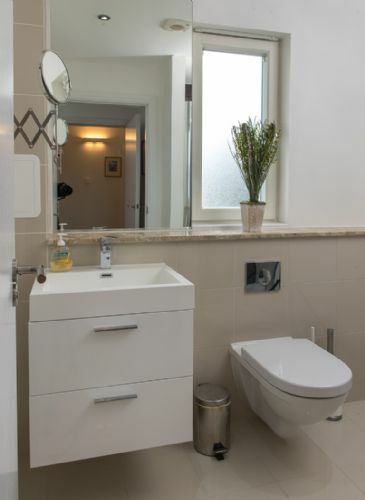 The apartment is very tastefully furnished, great to have two bedrooms and two bathrooms. The added bonus is the 2 parking spaces. It is very well equipped with everything you could wish for. Plenty of crockery, glasses etc. and enough pots and pans to cook a full meal if needed. It is very well located in Stockbridge and you have everything on your door step from the famous Mellis Cheesemongers to a local supermarket and Waitrose nearby. Any negatives - Some people may not like it being on the 2nd floor and apart from that the only other one would be we would liked to have stayed longer! 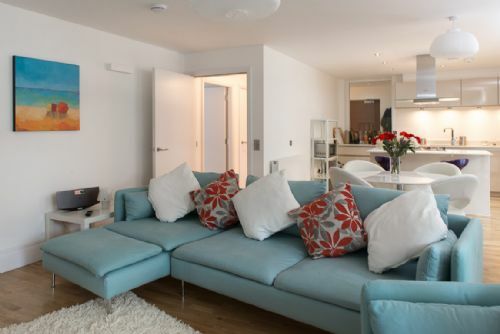 Comfortable warm, well located modern flat in the heart of Stockbridge. 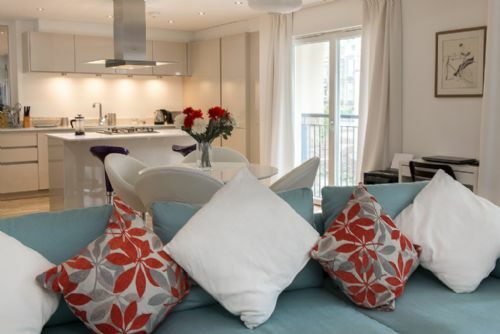 Easy access to shops, restaurants, galleries and the Botanic gardens. 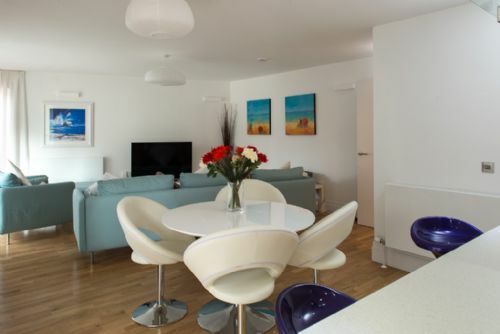 We spent nine nights at Dean Park Mews in Edinburgh it is a fantastic flat well located and very comfortably furnished to a high standard. Parking is available and the ability to access the best bits of Edinburgh are on your doorstep. The service from Greatbase is fantastic. We had a fabulous 4 day break in beautiful Edinburgh. 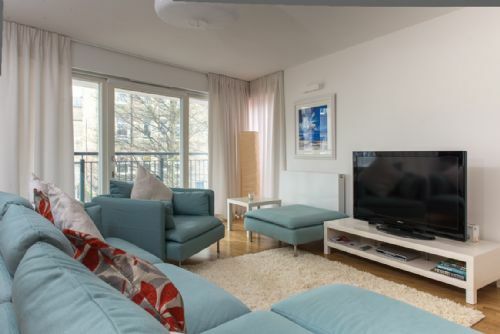 Stockbridge has all you need and more for a city break with a young family (great local walks, close to Botanic Gardens, regular bus service 10 mins to Princess Street, excellent Swedish bakery serving lovely breakfast and lots to see and do just on the doorstep). The apartment was clean, comfortable and had everything we needed. 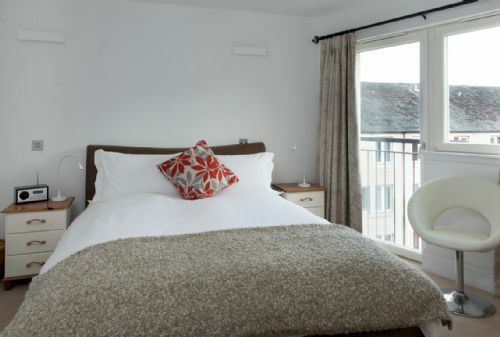 It is in a quiet spot off the main road through Stockbridge and provides a tranquil setting for a great nights sleep but just minutes away from all the city has on offer. The bedrooms were very comfortable, heating worked really well, showers and bath all good too. The kitchen is really well equipped and clean (although could do with a couple of new coffee/tea cups but minor problem). We would definitely recommend is apartment and would stay here again. A representative met us at the flat which was helpful in providing us with local directions and a chance to ask questions. TIP: If you are looking to get a food delivery to this apartment only Sainsbury's will deliver. As it is a new build Waitrose and Tesco do not have it on their system to select the address (as of Nov 2016) but if you call Sainsbury's they can input it manually (others will not). However, local Sainsbury's and Waitrose may mean you don't need this service anyway (just that we have small children and travelled by train so saved us a job). We had a fantastic family break and Edinburgh in Autumn is one of our favourite places. Don't want to end a review on a negative as very few things we wrong with this apartment- only reason didn't score excellent for condition: a couple of broken bathroom floor tiles (but am sure takes time to get these things fixed as it does for all of us) and 2 of the sliding doors to balconies don't have locks so can be opened-with children this may need looking at). This was the perfect base for our short break. Our host was very welcoming and great attention was paid to detail, would recommend. This was the second time we stayed in Dean Park Mews. The flat is in an excellent location for anyone visiting Edinburgh and perfect for those, like us, with a young family. The city centre is walking distance as are Inverleith Park and the Botanic Gardens. There are multiple restaurants, shops and pub within a few minutes and the garage removes the usual Edinburgh parking headache. Excellent apartment, really clean and new. The location was even better than we expected as Stockbridge is wonderful, with plenty lovely places to eat and drink but also within a short walk from the city centre. We thoroughly enjoyed our stay despite the hassles of finding the location and getting our car stuck in the wrong car park. The flat was well-equipped, bright and airy. Our suggestions would be: give slightly more specific instructions to help people find the place. 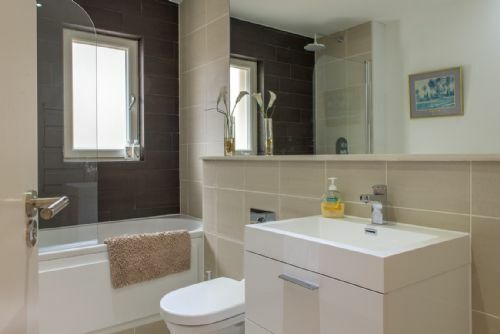 Also, we all found the Duvets to be MUCH too hot even with the slightly cooler nights.. We would also suggest putting non-slip mats in both the bathroom showers and fixing the above-sink lights. Other than those few points, we had a great holiday from this very convenient base. A lift for luggage would have been a plus (I am considered elderly), but everything else was fine. Everything we needed was within easy walking distance. All the arrangements for picking up the keys etc went smoothly. We were pleased by the extra touches of flowers and wine and a stock of basics. The apartment was very quiet and it was good to have a secure garage space. Highly recommended. One small suggestion would be to have up to date bus timetables for the buses that service the area rather than out of date timetables of buses that don't! Also although I have ticked the box for service during our stay as OK in reality we neither had nor needed any during our time in Edinburgh.